NRF VP Jonathan Gold: "Consumers are spending more freely and retailers are stocking up." The first half of 2017 is expected to total 9.7 million TEU, up 7.4 percent from the first half of 2016. NRF forecasts that 2017 retail sales will increase 3.7 to 4.2 percent over 2016. 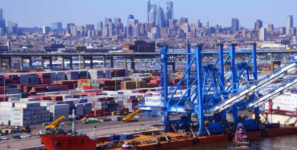 Imports at the nation’s major retail container ports should see double-digit year-over-year increases for the next two months as a growing economy increases the demand for affordable merchandise, according to the monthly Global Port Tracker report released today by the National Retail Federation and Hackett Associates. Ports covered by Global Port Tracker handled an unusually high 1.67 million TEU in January, the latest month for which numbers are available. The large volume came as factories in Asia shipped a surge of products ahead of Lunar New Year shutdowns and was up 6.5 percent from December and 12.5 percent year-over-year. The first half of 2017 is expected to total 9.7 million TEU, up 7.4 percent from the first half of 2016. Cargo volume for 2016 totaled 18.8 million TEU, up 3.1 percent from 2015, which had grown 5.4 percent from 2014. NRF has forecast that job and income growth coupled with low debt will drive 2017 retail sales – excluding automobiles, gasoline and restaurants – to increase between 3.7 percent and 4.2 percent over 2016. Cargo volume does not correlate directly with sales because only the number of containers is counted, not the value of the cargo inside, but nonetheless provides a barometer of retailers’ expectations. Global Port Tracker covers the US ports of Los Angeles/Long Beach, Oakland, Seattle and Tacoma on the West Coast; New York/New Jersey, Hampton Roads, Charleston, Savannah, Port Everglades, and Miami on the East Coast, and Houston on the Gulf Coast.